I have a confession to make! 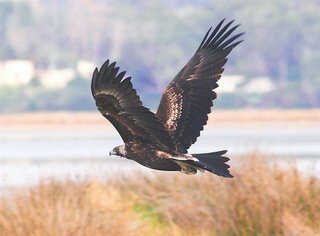 Although I wrote about visiting duck haunts in the previous blog, the real highlight of the morning was an encounter with a Wedge-tailed Eagle. I feel so much better now! I had driven along the Marion Bay Rd. towards Dunalley, and among the birds I noted were 2 Wedgetails sitting together on the branch of a dead tree some way up the bank and overlooking Blackman Bay. They were still there when I came back and although I tried photographing them they were too far away. I then crossed the causeway towards the beach, photographing a Little Egret on the way, and then on to the Long Spit Rd.. Whenever I go down this 'road' (it's deteriorating fast) I always keep an eye on the fences. Often there will be a bird of prey, chats, swallows etc. 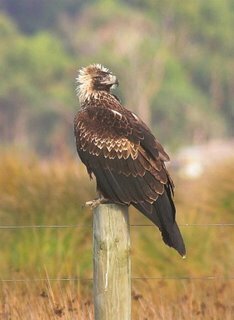 using the fence as a perch to view over the open paddocks/marsh. I noticed an obvious bird of prey in the distance on the fence, but a paddock away, but as I drew closer, I realised it was "big". I stopped and took the shot at top left, surprised that it allowed me to get so close. Three Wedgetails in 10 minutes! It finally took off towards the spit and I managed a few more shots before I lost sight of it. I moved on to the end of the road, and was preparing to walk to the beach, when it flew out of the tree I'd parked under!! If that wasn't enough it came back for a second run, unfortunately from a photographic standpoint, with the sun right behind it. The shot at left is of poor quality, but is the full frame 'as shot', which may give a n idea of how close it came. In the idiom of the day, "awesome". 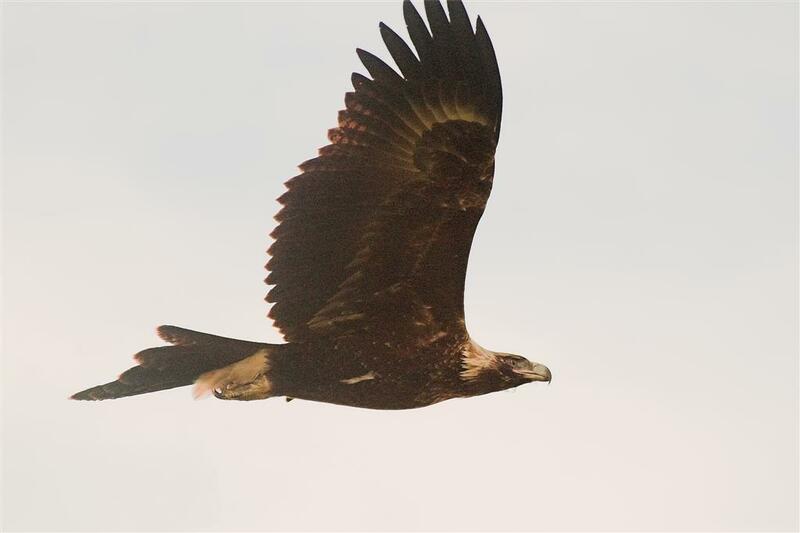 It truly is 'awesome' to have such a close encounter with such a magnificent bird! It will be an experience to stay with you for some time, I'm sure. And thanks for sharing the shots with us. Hi John,yes these encounters do stay with you for a long time. I can still recall, vividly, a late Winter afternoon encounter some 15 years or so ago. I was returning to Tullah on the Anthony Rd and came round a corner to be confronted by 6 Wedgetails feasting on a r/k wallaby. They scattered and 2 flew over my vehicle at about 1 metre.I suppose I was lucky I wasn't travelling faster--might have had consequences for both the eagles and myself! Amazing! I may just have to make it over to Tasmania during my upcoming trip to Australia... wow. If you check back on this posting to see this message, let us know - probably through Tassie, and we'll see if we can point you in the direction of some good Tassie birding. Thanks John for the comment to Leigh. I had overlooked doing so and I was going to add that the grass always seems greener....as I head in the opposite direction shortly, albeit to Illinois, not California where Leigh is based I believe.Hope Leigh can make it here. Via tassiebirds e-mail address for more info Leigh if you wish.